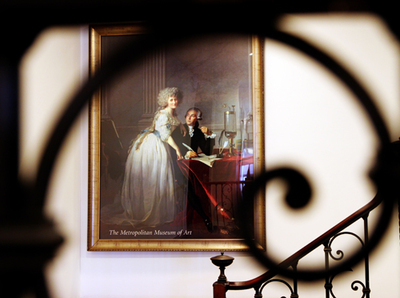 In 1927, John D. Rockefeller, Jr. presented to the Institute a magnificent painting of the chemist Antonine Lavoisier, by Jacques Louis David. There could not be a truer symbol of the Institute’s scientific vocation, and of William H. Welch’s influence on its destiny. It was Lavoisier who placed chemistry at the center of the contemporary biological sciences, and it was Welch who, indirectly through Simon Flexner, committed The Rockefeller Institute to the chemical view of medical research. Antonine Lavoisier, Jacques Louis David, John D. Rockefeller, Jr.